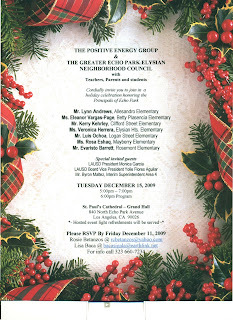 Echo Park's elementary school principals will be the guests of honor at a community reception hosted by the Positive Energy Group and the Greater Echo Park Elysian Neighborhood Council. The reception will be held on Tuesday, December 15, from 5 p.m. to 7 p.m. at St. Paul's Cathedral (840 N Echo Park Ave). Please RSVP by Friday, December 11, to Rosie Betznaos or Lisa Baca. For more information, please call 323/660-7234.